So the kitchen and garage works to the house is complete, Christmas and NewYear are over and my build can finally start for real. I'll try to keep that updated but will add to this thread as well. I've started with a rolling chassis with engine and gearbox installed to give me a fighting chance of getting it on the road for summer 2020. Wish me well. No doubt there will be a number of question to follow. Many thanks. Looking good so far Nigel. Best with your build. High on the list of jobs to do before the body is reunited with the chassis is to fit the heater. So I thought I would give it a go. AK recommend either a heater from the MK2 VW Polo or the Heat3 heater from CBS. I have decided to go for the Heat3 unit and put it in a box. 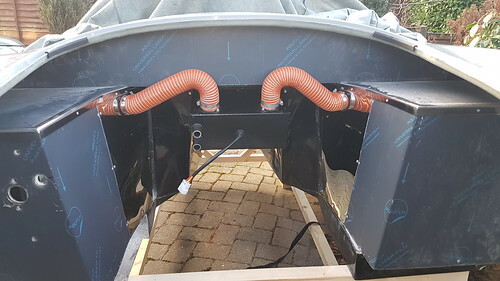 I have made the box out of Aluminium sheet and fitted it to the engine bay bulkhead. All seems OK from this side and I'll think about routing air to the demisters and cabin when I come to do the interior. I have now fitted the fuel pump and filter. There seems to be some different opinions as to whether to put a filter before the pump or not. The pump suppliers say you must. But they also tend to say that the pump should be within 600mm of the tank. I cannot find an acceptable way of fitting a pre pump filter and keeping within 600mm in the AK. So I have fitted free flowing 50 micron filter anyway and, with crossed fingers, fitted the pump approx 750mm from the tank. So should I fit another finer filter downstream of the pump prior to the fuel rail. The belts and braces solution is to fit one but is it really necessary........?? I had issues with dirt in petrol when abroad. Injector blocked etc. Northampton M/Sport sorted the issue and stated I should have another filter before the engine. They put this on while I was there and kept the paper filter which they stated is fine for the LS3. AKCharlie - ''AKA SOOTY'' - AK GEN2 - LS3 - 6.2litre - 434bhp - A dream come true. 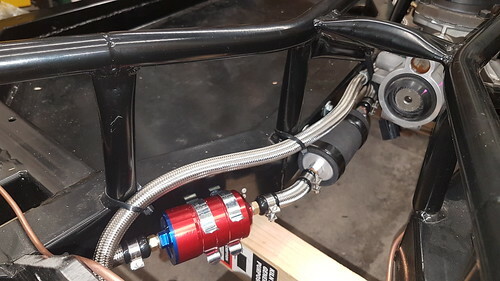 I think the idea is to have a coarse filter before the pump to protect the pump and then a finer gauge filter closer to the fuel rail/carbs to protect those. Charlie, was there a link or pic of the 'this' one you mention.